Lost In The Warp: Something Orky this way comes…. Something Orky this way comes…. 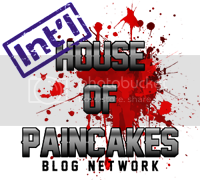 So the post is a little late but I think it is worth it. I have nearly completed a special commission build for an old friend of mine who is building a Death Korps of Krieg (DKoK) themed Blood Axe Ork army. 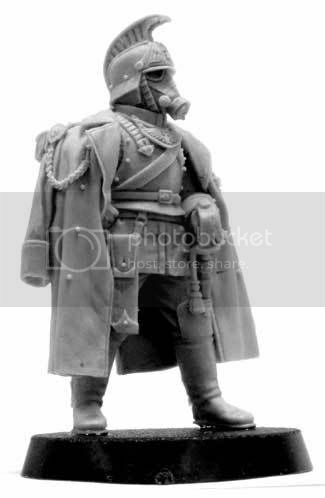 The inspiration for his force came from MicroArt Studios release of Ork heads wearing gas masks and helmets and indirectly the similarily themed army that the original sculptor of these masks has created. I have ordered things from MAS before and was genuinely pleased with the product. 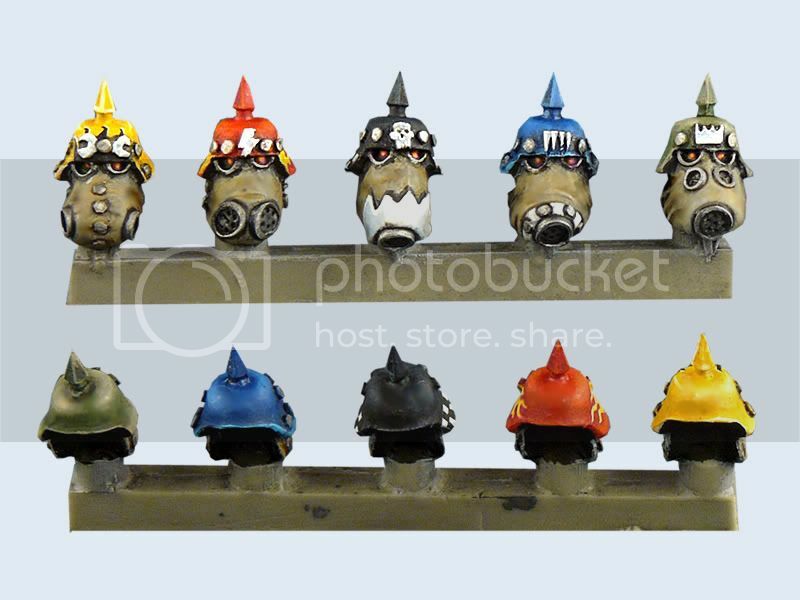 These heads that my friend has purchased are, in my opinion, not as nicely sculpted as some of their other pieces but really do still have a great deal of Orky charm and look super cool when spread across an army. My friend asked originally if I knew of someone who could complete this project for him in a reasonable time frame and within a certain budget. I rarely take commissions anymore but with my upcoming trip to see the Canadian battlefields in France, Belgium and Holland over the March break it just seemed like too good of an opportunity to pass up! Aside from that, I REALLY liked the concept and thought that while it would be a good deal of work it could also be really fun and a good warm up to working on my Golden demon plans for this year. 2. 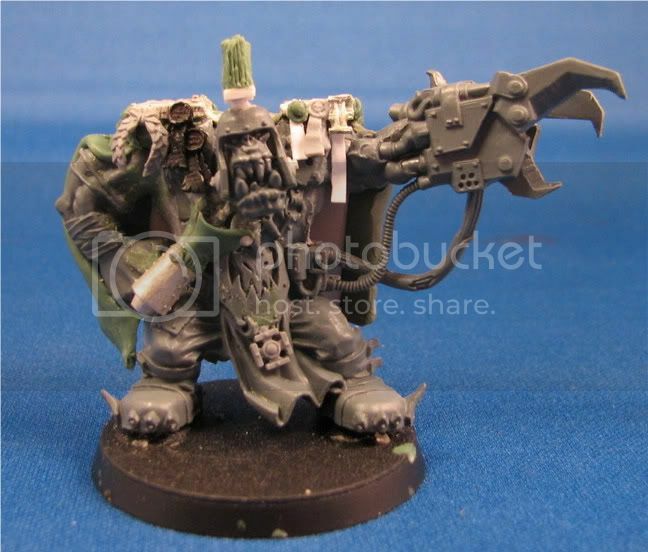 Should have a hand on hip or behind back pose - this model is using his head to lead by pointing and giving orders not charging at the head of the Waaaaagh! 4. It is a gaming model and should be durable enough for careful but regular handling. Based on the first point I decided that the model should have a gasmask and the obligatory helmet. The mask would be better hanging around the neck instead of on the face as it would allow for more expression and a more character. As such I actually swapped heads for a plastic Nob Head with closed mouth. This would give me more room on the chest for hanging the mask than the open jaw and gave me an appropriate presculpted helmet once I removed the horns. GREAT! All I had to do was make the head crest. With the head taken care of I focused on the body. 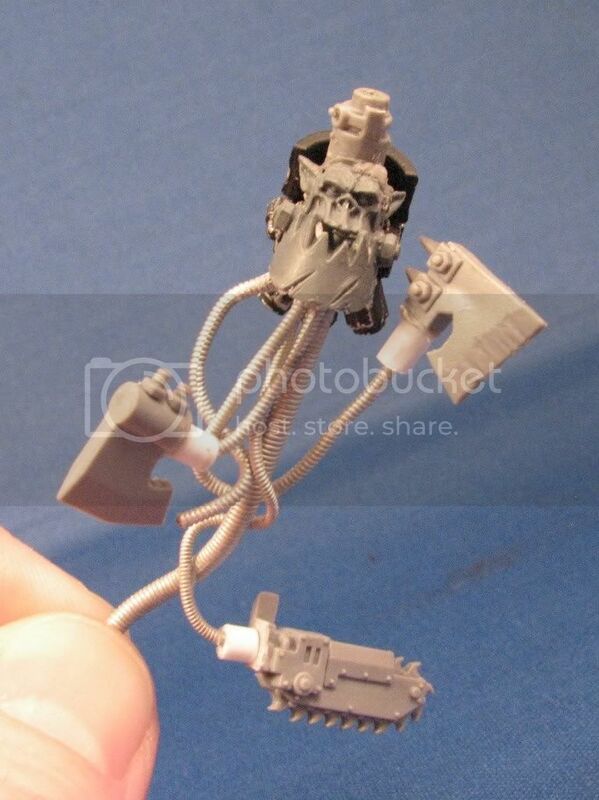 The ork warlord is a push together backand front model with a lot of gear on his back. 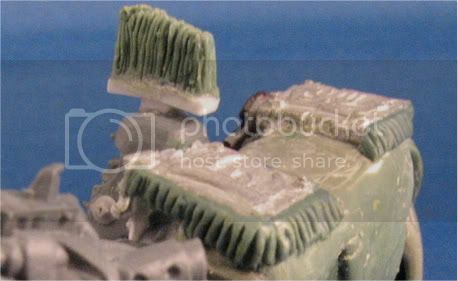 As there wouldnt be room for these with the coat I was planning I removed the whole section and resculpted it in Pro-Create putty. I also filled and resculpted the lats and underarm areas so that he retained a broad muscular appearance. 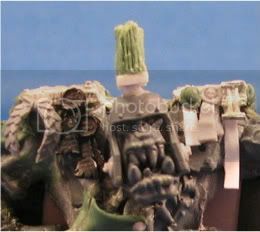 At the same time I removed the gun and resculpted the top portion of the warlords hand to hide the removal. The shoulder was then cropped up and the whole arm repositioned for a hand on hip serious order pose that I was really quite pleased with. This also let me blend the putty of the remade shoulder into the back and side of the model while everything was setting up. 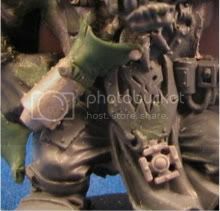 I decided that regular frilly epaulettes (the decorative shoulder things that officers have) wouldnt really suit this blood axe lord so instead I filed down the plastic shoulders of the model and attatched metal Ork Glyph plates to act as appropriate shoulder details. When I sculpted the fringe I originally did it really fine but then just didnt buy the feel of it so I ripped it off and made it over in a chunkier style which, though less technical and less realistic, really better echoed the orky style and appearance. From there I worked on the coat starting with a plasticard sheet that I bent and shaped into place. This would give the coat a lot more structural integrity considering that it would be handled in game and transported in a figure case. I was quite pleased with the way the sleeves turned out and the coat overall looks good. I purposefully left the back of the coat mostly smooth and undetailed so that a large blood axe logo could be freehand painted on there with less difficulty. though I did add a little detail to the bottom which I felt tied back to the original inspiration of the Imperial look. After that it was a bit of detailing, adding mounting brackets for the gasmask to the sides of the helmet, and I gave sections a wet sanding using 1500 grit sandpaper which while making my putty look rougher/uglier in the pictures actually smoothed out a few small sections that I wasnt happy with and will make it look much better when primed and painted! 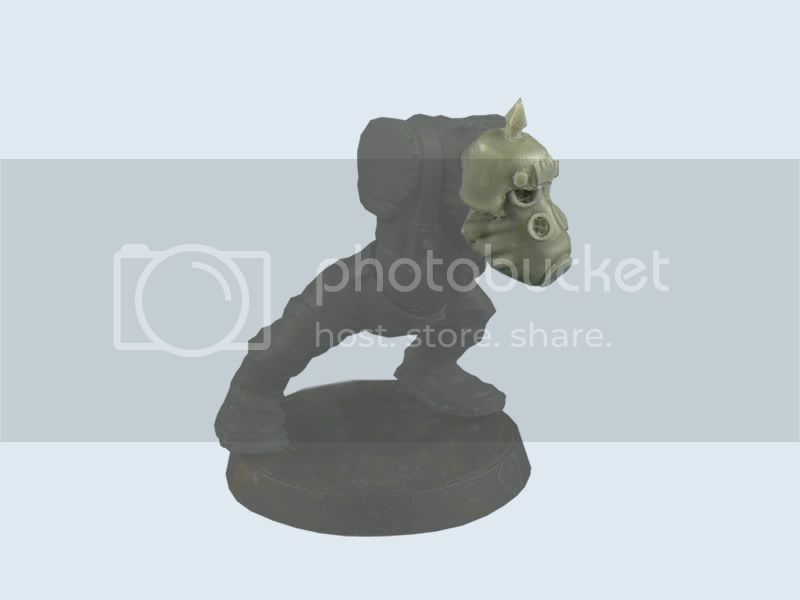 Finally I had to deal with the attack squig and after chatting with my friend I came up with a few options for him. 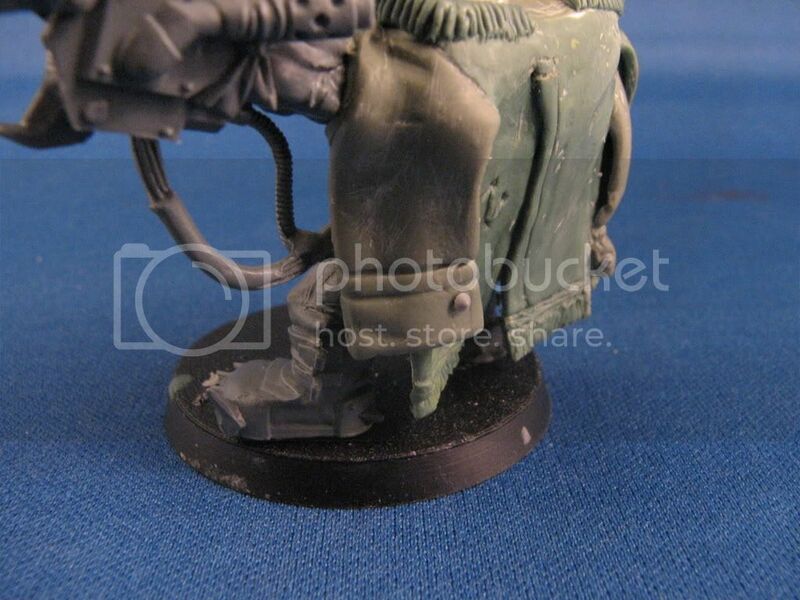 I included a metal squig for the base which would look good sitting right at his feet. I also came up with a rather random alternate choice for him - in keeping with his idea that this is a tech savvy Ork who likes to emulate humanity I made him an appropirately Orky servo attack skull! This piece was made from An Ork nob head, some plastic tubing, Ork weapons the smoke launcher from an old dreadnought and cast metal hoses from Dragonforge Design (I LOVE these things!!!). In the end it is kind of silly but certainly fun. Ill leave it to him to decide what he wants to use. So here he is - Da Kommisar - in all his Orky converted glory ready to be painted and coming soon to a battlefield near you. I hope you have enjoyed this little project and will look back for updates in the future where I will be showing off the model painted by its new owner. Cya Next week.